Initially on PCs, the multiple output interface was designed to display the same image on all output interfaces (sometimes referred to as mirroring or cloning). This reflected the fact that these video cards were originally used in presentations where the user typically had his or her face to the audience with a duplicate of the projected image available to the presenter. In "extended" mode, additional desktop area is created on additional monitors. 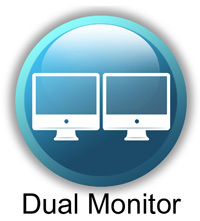 Each monitor can use different settings (resolution, color, refresh rate). Macintosh computers have supported the "extended desktop" concept since the late 1980s, increasing the platform's utility for professional media and software developers such as graphic designers, video editors, and game developers. The concept was further developed by PC manufacturers and led to the "extended" or "independent displays" mode and the "spanning" or "stretched" display mode. In both of these modes, display devices are positioned next to each other in order to create the illusion that the two displays are logically contiguous.